I may like collecting these figs a little too much. So these are most of the figs from 2011's introduction of the theme through 2017's Hands of Time series. It's fairly complete, with a few tweaks, mostly in terms of Nya's row. 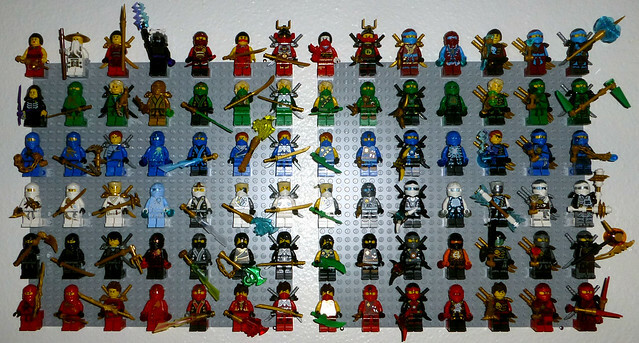 I mean, I could display these on my various Ninjago buildings, but I like this setup better. My favorite costume design is definitely the Skybound costumes. I also like the Kimono costumes, the Elemental Tournament (full color) costumes, and the pure energy Airjitzu costumes. Least favorite would probably be the Techno Blade costumes and the Possession (Ghost) costumes. Which ones are your favorites? As far as characters are concerned, that's a little tougher. My favorite characters from the show are definitely Jay and Nya, and I like their figs a lot too. (Nya mostly because she was harder to get in the earlier years, so more value added to the design.) Zane also got a lot of neat looks after he became a fully metallic Nindroid. Skybound Ghost Cole is also my favorite; I kind of wish he had stayed as a ghost for longer, that seemed like a neat character trait for him until the story decided he was going to disappear otherwise. Plus, green is my favorite color, so lots of Lloyd's designs appeal to me. I guess Kai is okay too, but unfortunately he's never at the top of my list. Sorry Kai. That is a lot of figs! You definitely should put together a fancier display for them, keeping it modular enough to add baseplates as needed. I'll admit, I was a little skeptical of certain people's existence that Bionicle could have stared the Toa Mata for its whole run, if Lego wanted to do it that way. But after seeing how Ninjago has done exactly that for 7 years, and thrived, I think I understand now.